With the influence of multiple major releases by iconic musicians like The Who, Sabbath and Deep Purple, just the name of the band, 1968, shows that this band is here to rock. Blending elements from the time when, what now is known as ‘Classic Rock,’ was dominating airwaves across the world, the band gives a strong nod to the bands that helped define the genre, giving their own unique spin on the music of the past. With the release of their 4-track EP Fortuna Havana, the sound of the band is unique and modern. The best way to describe it is if you combined the instrumental sound of Deep Purple and Black Sabbath, then added Soundgarden frontman Chris Cornell for vocal duties. 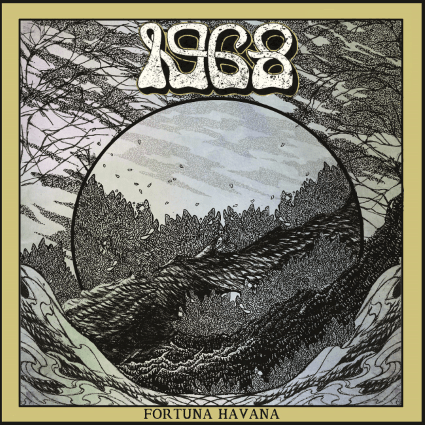 1968 combines the elements that all classic rock fans appreciate when it comes to the genre, the powerchord-heavy, distorted guitar work, funky bass lines and powerful drumming, but they also add elements to the music like the vocals to help them stand out. The opening track “Vorpal” with its guitar riff from Sam Orr, lays down the foundation of the track, before the band drops in with their heavy tones. The song quickly builds when Jimi Ray’s, rough and grungy voice punches into the instrumentation, completing the sound. The track includes stellar bass work from Tom Richards, who uses his instrument to add another layer to the sound, leaving drummer Tom Drury to complete the mix with his kick drum and cymbal technique. The album itself was a breath of fresh air for myself. With the progression of music and the questionable turn many genres have taken, it’s easy to forget where the sound came from. 1968 proves that they are here to help the Golden Age of music and Classic Rock live on forever. You can give the album a listen when it is officially release on digital formats on February 10th, 2017 via Black Bow Records.